Well the last post was fun …but I think it’s time to move on to something else. Something significant did happen today. 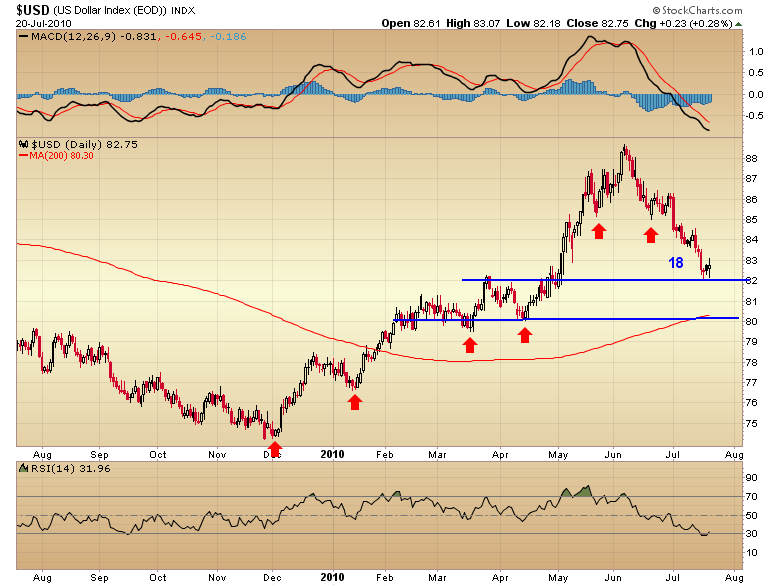 The dollar broke through the 82 support zone. This is the first condition of three that will tell us if the almighty dollar is now caught in the clutches of the 3 year cycle decline. The other two are a break below 80 and the next intermediate cycle must turn out to be a left translated and failed cycle. But let’s start with the current daily action. First off a little cycle information. 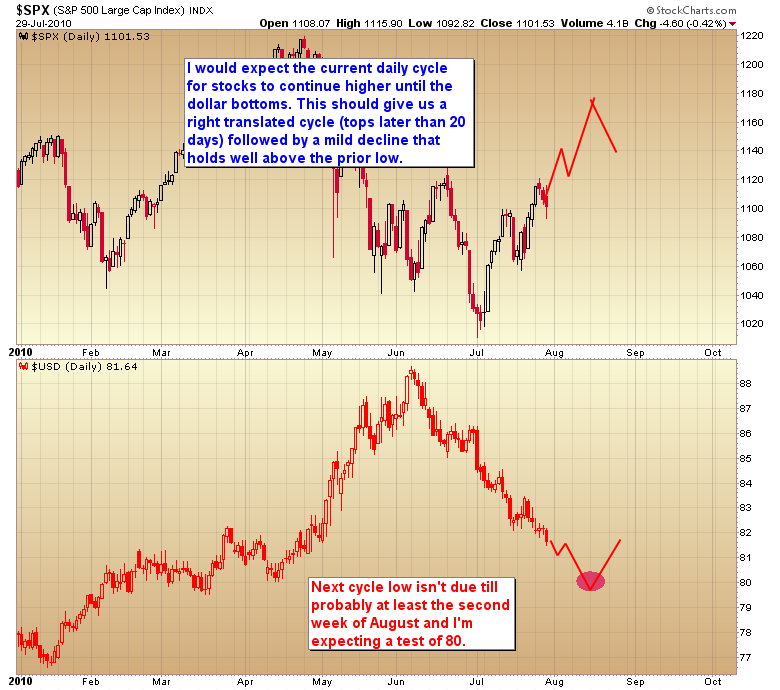 “Most” daily cycles (for the dollar) tend to run about 20 days but can stretch up to 30 and not be abnormally long. 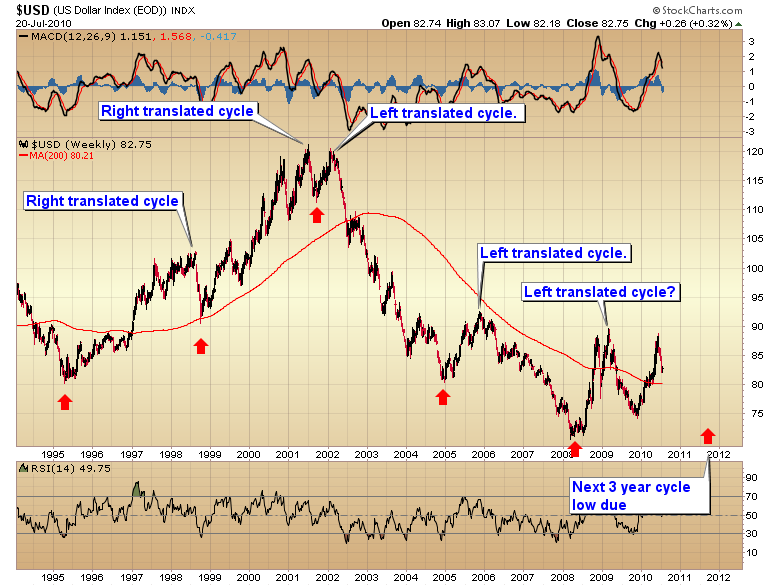 Also note that most left translated cycles tend to drop below the previous cycle bottom. 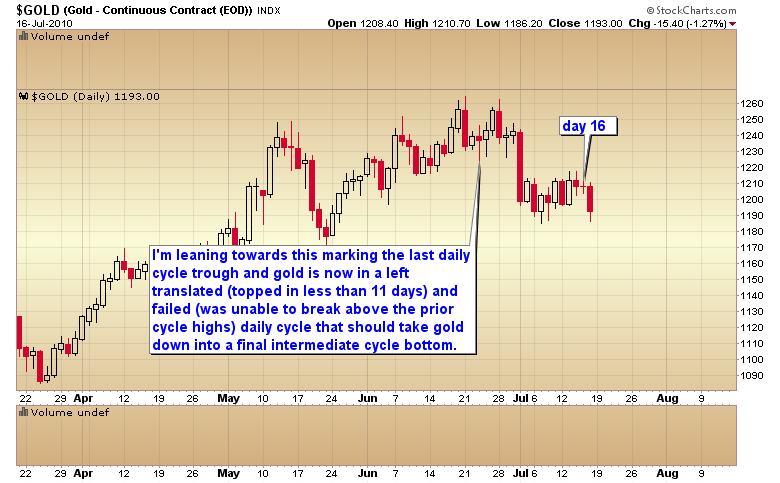 A left translated daily cycle is one that tops in 10 days or less. Here is a 7 month chart of daily cycles. I’ve marked the troughs with a blue arrow and noted the length. If the cycle was left translated I marked it with an L.
As you can see the last three cycles have all been left translated and they all bottomed below the prior cycle bottom. The last cycle, and it now appears the current cycle, were and are extremely left translated. Those tend to produce the worst declines. The break of 82 today not only meets my first warning sign that the dollar is now in the grip of the 3rd year cycle low, it also puts the odds heavily in favor of July 16th marking the last daily cycle bottom. The reason that is important is because the cycle is only on day 9. There should still be 2 to 3 weeks left before the next major bottom. One of the conditions necessary for the stock market to continue rallying is for the dollar to continue falling. Today’s action is a big check mark in the continuation theory. As you can see each one of the major impulsive moves down in the dollar sparked powerful rallies in stocks. As we still have at least a couple for weeks before the next major bottom we should see the stock market rally at least another 2 to 3 weeks. That is going to force the current daily cycle for stocks into a right translated cycle. As I said before those tend to hold above the prior cycle bottom. Keep in mind I’m just guessing on levels. I’m just illustrating general trajectories and time frames not actual targets. At that point the dollar will be ready to put in a major intermediate cycle low and we should see a more substantial rally. If that rally fails and moves below the August bottom then we can close the book on the dollar. At that point there will be virtually no question that the 3 year cycle low has its hooks in the dollar and off we will go. This should spark extreme inflationary pressures and as I’ve pointed out before every C-wave in gold has been driven by a major leg down in the dollar. I have no doubt the current C-wave will be driven by the dollar falling (maybe crashing) into the major 3 year cycle low. I’ve said many times that Bernanke is going to pay a price for his insane monetary policy. In the world we live in one just doesn’t get away scott free after printing trillions of dollars. Heck Greenspan didn’t get away with printing billions after the tech bubble burst. The end result was a housing & credit bubble that ultimately burst and sent the world into the second worst recession since the Great Depression. Does anyone seriously think Bernanke can one up Greenspan by many, many multiples and not have anything bad happen? I can assure you that you are dreaming if you think the market is just going to “let this one slide”. There are going to be extreme unintended consequences and I’m about 99% sure they are going to come at the dollar’s 3 year cycle bottom next year. This entry was posted in Uncategorized on July 30, 2010 by Gary. I thought I would post on a topic that’s sure to stir some dander, mostly because I just needed something to clean the comments. My thoughts are and have been for a while that in a purely fiat system deflation isn’t an inevitability, it’s a choice. The only other time than the 30’s that we’ve seen real deflation was in late `08 to March `09. Many have the view that we will experience deflation first then inflation, but I would point out we already did. We just went through the deflation part of the equation in 08/09. That was true deflation. Prices for virtually everything were collapsing. It lasted for 9 months. Just like Roosevelt did in the 30’s, Bernanke stopped deflation dead in its tracks by massively inflating the money supply. If deflation is an inevitability how could that possibly have happened? I’ve heard all the ridiculous theories that without credit expansion we can’t have inflation (actually total credit is expanding almost exponentially as the government has taken over where the consumer has left off). I’m sorry they don’t hold water. Almost across the board we have had massive inflation in virtually all asset markets since early `09. All without the banks lending. Obviously the liquidity that Ben has forced into the market has landed in the financial markets first. Let me say this again because it’s important. As long as a country is willing to destroy it’s currency deflation isn’t an option. The key in that statement is “the willingness to destroy the currency”. If deflation starts to get a toe hold again the government could simply print money and mail out checks to every man, woman, and child. Does anyone think in that scenario deflation is possible? Of course it’s not. The deflationist’s will argue that the government can’t, or won’t, do that. Hey they have to make that assumption because obviously deflation isn’t possible if the government just starts mailing free money to everyone. But the fact is that they can and they will, actually they already have…twice. They were called rebate checks. Anyone who thinks it won’t happen again if deflation starts to rear it’s head is just kidding themselves. In a purely fiat system deflation is a choice. I would say it’s pretty clear that the government is willing to sacrifice the currency to keep deflation at bay and they have been doing so ever since 2001. For me to buy the deflation theory one would have to explain how Ben could have stopped the worst deflationary spiral in a mere 9 months and you will have to explain to me how deflation can possibly survive another bout of free money (more tax rebates or whatever they choose to call them next time). This entry was posted in Uncategorized on July 29, 2010 by Gary. I want to discuss something that came up on the blog Friday. An anonymous poster hinted that we were going to see more gold weakness in the days ahead because Paulson was having to sell his positions. Folks, big smart money traders like John Paulson don’t sell into weakness. These kind of investors don’t think like the typical retail investor who is forever trying to avoid draw downs. Big money investors take positions based on fundamentals and then they continually buy dips until the fundamentals reverse. The fundamentals haven’t reversed for gold so I’m confident in saying that Paulson isn’t selling his gold, he is using this dip to accumulate. With that being said there are times when big money will sell into the market and it is why so often technical analysis as it’s used by retail traders doesn’t work. They do so in order to accumulate positions. Let me explain. When a large fund wants to buy, it can’t just simply start buying stock like you or I would. Doing so would run the market up causing them to fill at higher and higher prices. Unlike the average retail trader, smart money attempts to buy into weakness and sell into strength. (Buy low, sell high). In order to buy in the kind of size they need without moving the market against themselves, a large trader needs very liquid conditions. Ask yourself, when do those kind of conditions exist? They happen when markets break technical levels. 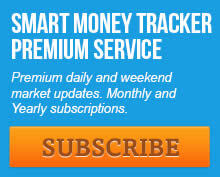 Smart money understands how to “play” the technical traders. If Paulson is selling it is because he is trying to push the market below a significant technical level so all the technicians will puke up their shares to him. By running an important technical level he can trigger a ton of sell stops to activate, allowing him to accumulate a large position without moving the market against himself in the process. We saw this very thing happen in the oil market recently and also in February as gold bottomed. Technical traders wrongly assume these breaks are continuation patterns but the reality is that very often they are just smart money “playing” the technical crowd so they can enter large positions. 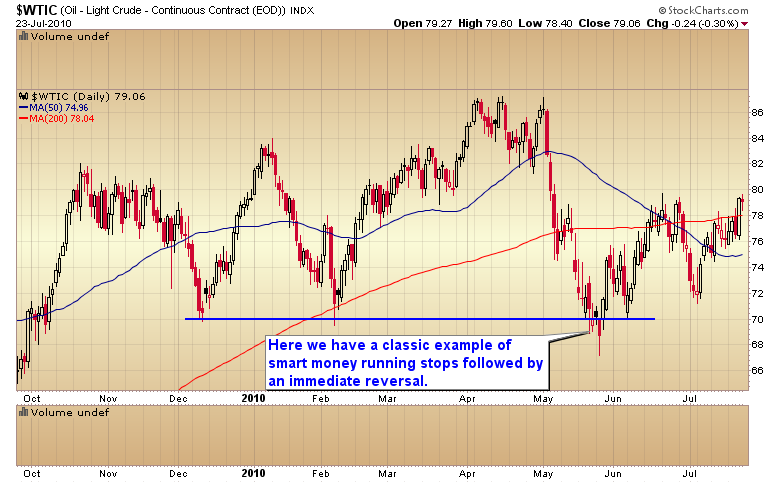 The key to watch for is an immediate reversal of a technical break. When that happens you know there was someone in the market buying when everyone else was selling. 9 times out of 10 it was smart money. At the moment everyone is jumping on the bear side for gold. Remember we saw this exact same sentiment in the stock market 3 weeks ago. I knew the bears were going to be wrong simply because the market was way too late in the intermediate cycle for there to be enough time left for a significant decline. The gold bears are going to be wrong also and for the exact same reason. It is just too late in the intermediate cycle for there to be enough time left for anything other than a minor decline. I’m now waiting, and hoping for a break of the May pivot. I want to play that break if it comes like a smart money trader. That means I want to buy into the break instead of panic sell like most dumb money retail traders will invariably do. The reason of course is that gold is still in a secular bull market. In bull markets you buy dips. Also the dollar with the break below 82 this morning is starting to show signs that it is now in the clutches of the 3 year cycle decline. 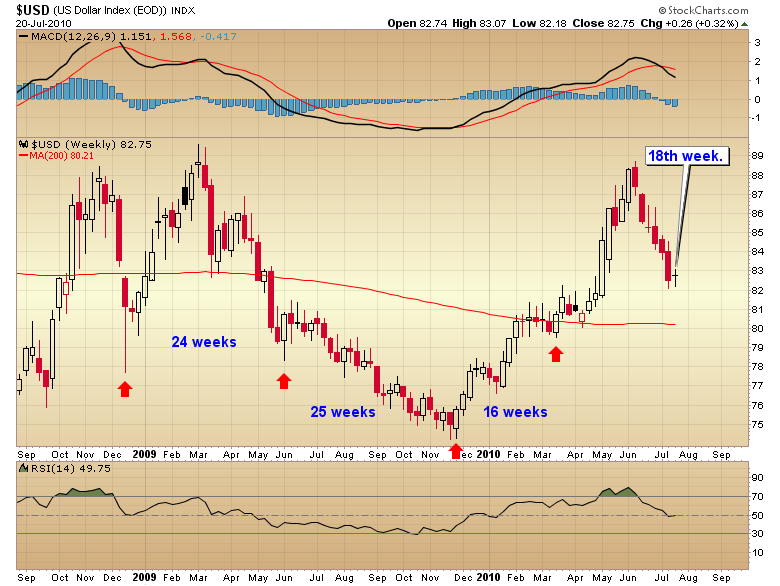 Every C-wave so far in this 10 year bull market has corresponded to a major leg down in the dollar. I’m confident this C-wave will inversely track the dollars move into that major cycle low due early next year. Sentiment wise gold has now reached levels more bearish than at the February bottom. That means gold is at risk of running out of sellers. 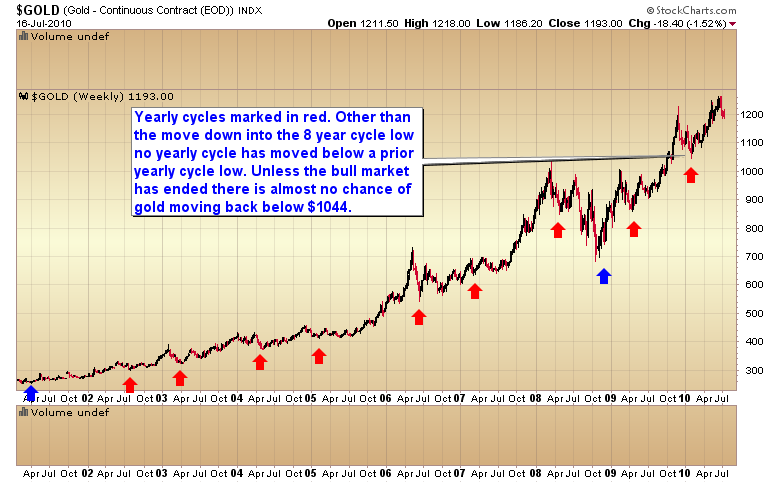 And finally, and most importantly it’s just simply too late in the intermediate cycle for gold to have enough time for a significant drop. This is the 25th week of the cycle and the intermediate cycle rarely lasts more than 25 weeks. That puts the odds heavily in favor of a major bottom either sometime this week or next. And don’t forget gold is about to move into the strong demand season. 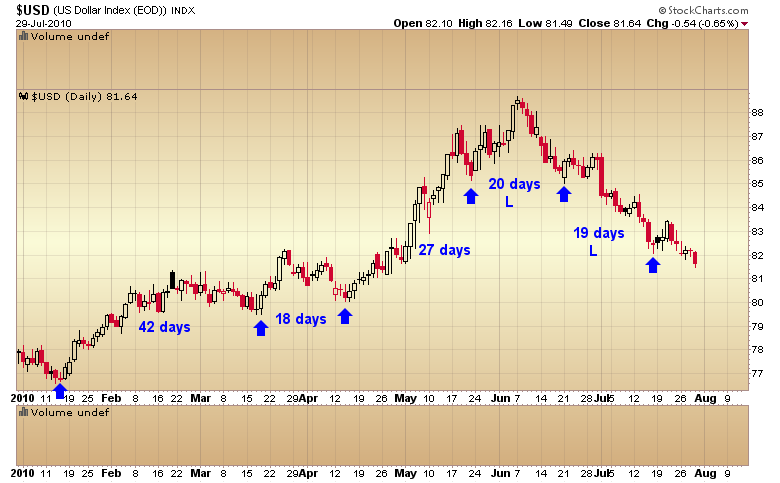 Like clockwork gold invariably puts in a major bottom in July or August before the run up into the strong fall season. The bears are going to be wrong again. This entry was posted in Uncategorized on July 27, 2010 by Gary. A couple of weeks ago I posted the possibility that the market might be forming a head and shoulders bottom instead of the top everyone was so focused on. I knew at the time that the intermediate cycle was in the timing band for a major low and sentiment had moved to bearish levels even more extreme than what we saw at the March `09 bottom. Calls for a market crash were flying left and right. I’ll let you in on a secret, we always hear that the market is going to crash at intermediate cycle bottoms. The reality is we’ve had three real market crashes in the last 100 years. The odds of a fourth following right on the heels of the third are pretty darn slim. 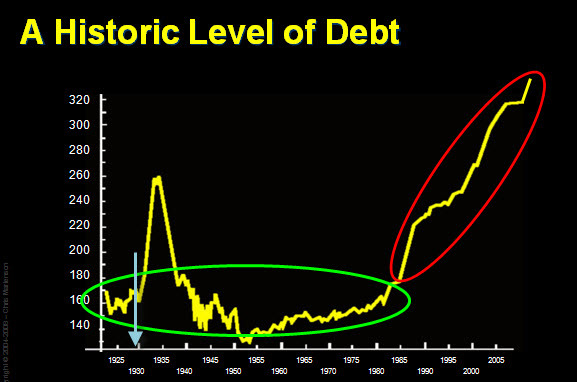 The first and the third crash were caused by credit bubble implosions and the second was caused by severe overvaluation in the fifth year of a secular bull market. These fifth year corrections are fairly common in long term bull markets as it seems like it takes about five years for sentiment to swing to the extreme bullish side. Then the fifth year correction serves to wipe out that bullish sentiment so the secular fundamentals can continue to drive the bull higher. Not withstanding the very low odds of a market crash, I knew that we were way too late in the intermediate cycle, and sentiment was way too bearish for there to be much chance of the head and shoulders top succeeding (actually head and shoulders patterns only succeed and reach their target about 27% of the time). Not to mention everyone saw it which gave it even less odds of actually playing out like everyone was expecting. At that point it became much more likely that the market wasn’t forming a head and shoulders top it was in fact probably going to form a head and shoulders bottom with the half cycle low forming the right shoulder. No one else at the time was calling for any such outcome, as a matter of fact I took an amazing amount of abuse for my temerity to even consider such a ridiculous idea. As of yesterday the Dow has now completed the inverse head and shoulders pattern by breaking the neckline just like I thought it would. Now will it reach it’s target (11,200)? The odds say no. But it’s anybodies guess at this point. What we do know is that virtually all indexes have rallied out of the half cycle low to new highs thus breaking the pattern of lower lows and lower highs. Higher highs and higher lows is the definition of an uptrend. This was why I’m not ready to call a bear market yet. I was confident this rally was coming and we need to see were it goes before we can say with any confidence that we are back in the secular bear trend. We now have two clear lines in the sand. If the market breaks out to new highs then the perma-bear/deflationists were too early and the cyclical bull still has some kick left. 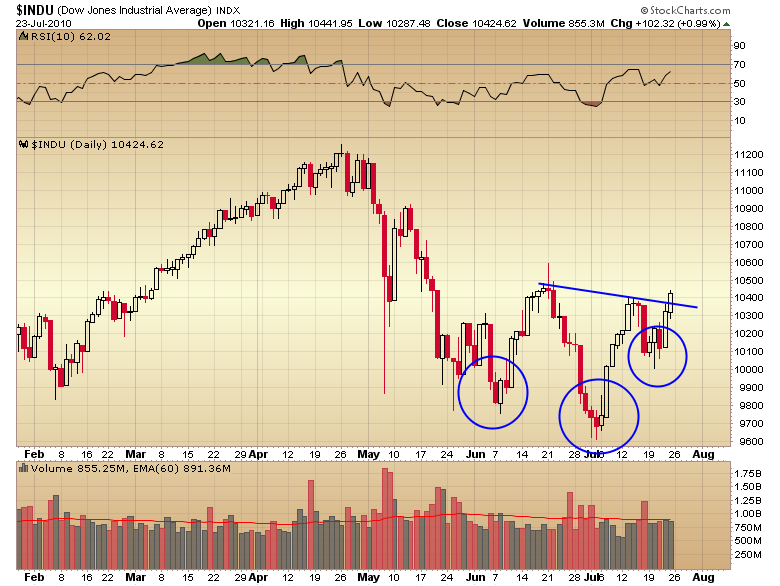 If the market (both Dow and transports) break below the July 1st low then yes the bear is back. As long as the market holds between those two lines we will remain in no-mans land. Right now the market is in rally mode just like I warned would happen. We just have to wait and see whether it turns out to be a bear market rally or another leg up in the cyclical bull market. I for one, have no intentions of trying to guess which it is until one of those lines gets broken. This entry was posted in Uncategorized on July 25, 2010 by Gary. One of the few patterns that I actually pay attention to besides triangles and the T1 pattern is the “crawling pattern”. Most of the time this plays out in bearish fashion as a stock or index crawls or bumps along a rising 50 day moving average. 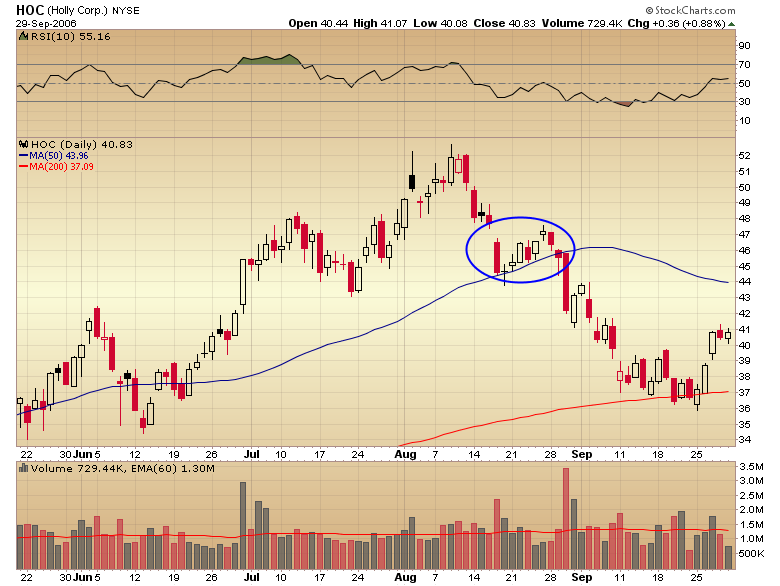 Once the support breaks it’s usually followed by an aggressive move down to test the 200 day moving average. Recently we saw this pattern play out in the dollar index. As you can see when support broke the dollar moved aggressively lower and may still have further to go as it still didn’t move all the way back to the 200 DMA yet. 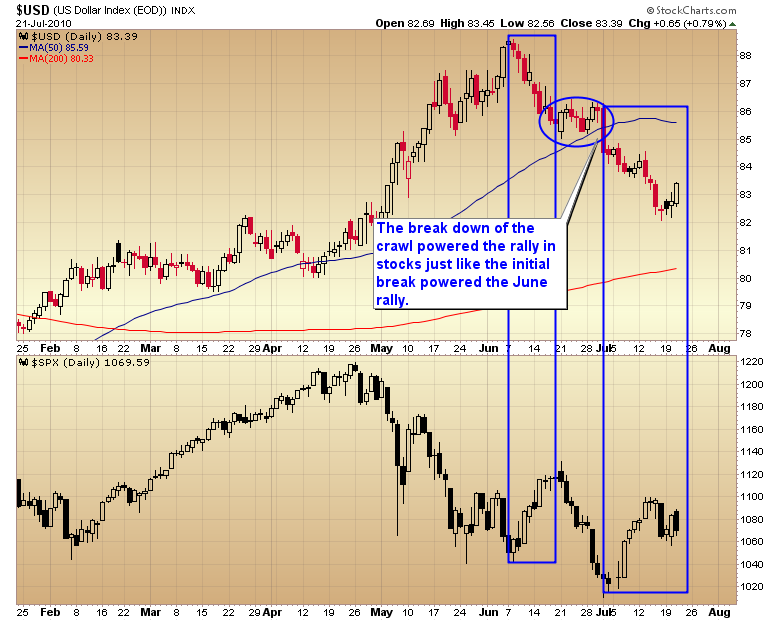 I’ve also noted that the break down powered the rally in the stock market. 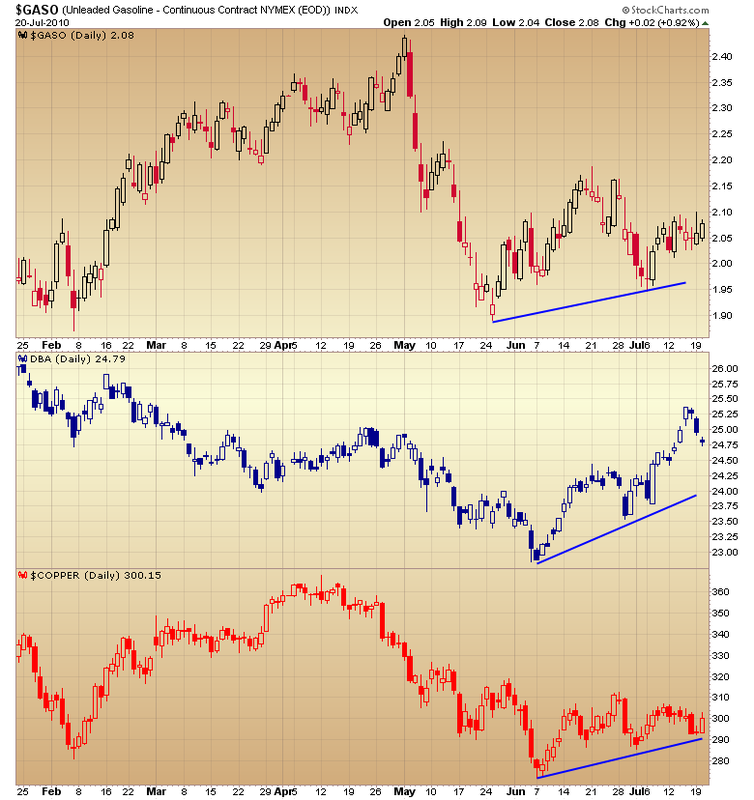 As a matter of fact both legs down in the dollar powered strong rallies in stocks. I’m pretty confident that if the rally is to continue Bernanke is going to have to keep pressure on the dollar. Now we have this same pattern starting to develop on the S&P although in reverse form. 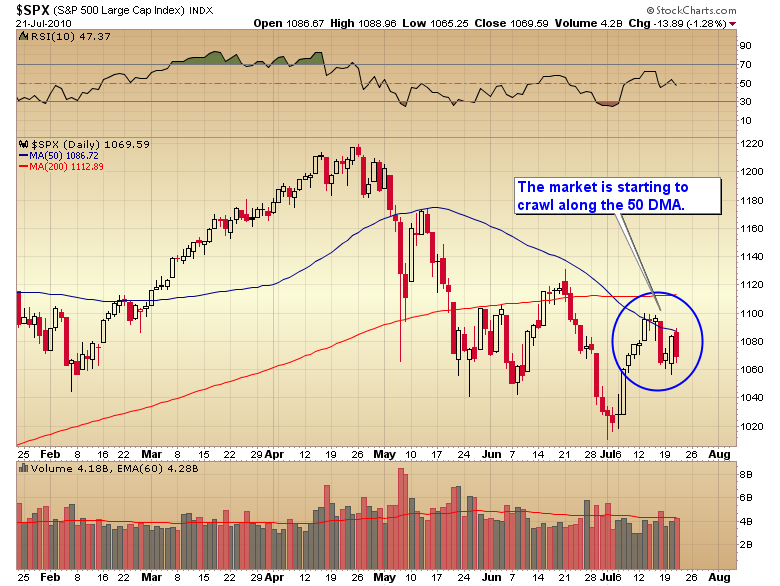 If the market breaks above the 50 it should power a very aggressive move higher. This entry was posted in Uncategorized on July 22, 2010 by Gary. In my last post I briefly explained the mechanics of the gold cycles. Tonight I’m going to do the same thing for the dollar. 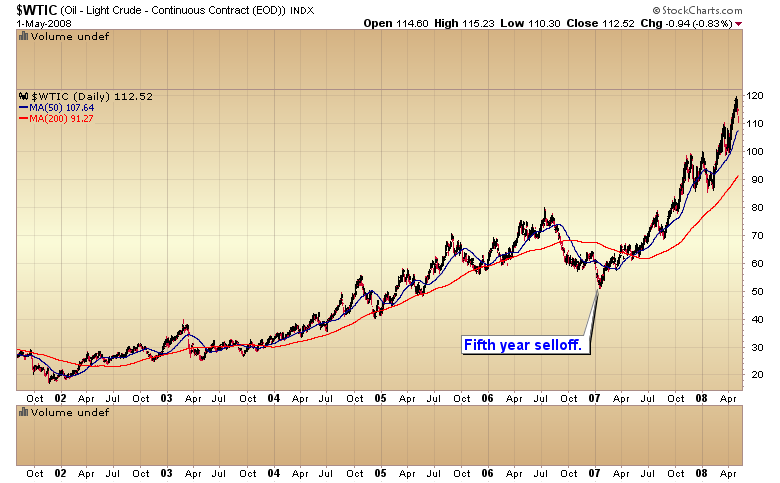 Like I did with gold I’ll start with the largest cycle, in the dollars case it is the 3 year cycle. Before I go any further I should probably explain the concept of left and right translated cycles, as it is pertinent to the current situation we find ourselves in. When I call a cycle left translated what I’m saying, in effect, is that the cycle topped left of center. As an example any dollar 3 year cycle that tops in less than a 18 months would be labeled a left translated cycle. One that tops later than 18 months would be a right translated cycle. Why do we care whether a cycle is left or right translated you ask? Well because how a cycle tops will tell us more times than not whether we are in a bear trend or bull trend. Cycles that top as left translated cycles are the hallmark of bear markets and more often than not the cycle trough, when it comes, will move below the prior trough. The opposite is true for right translated cycles. 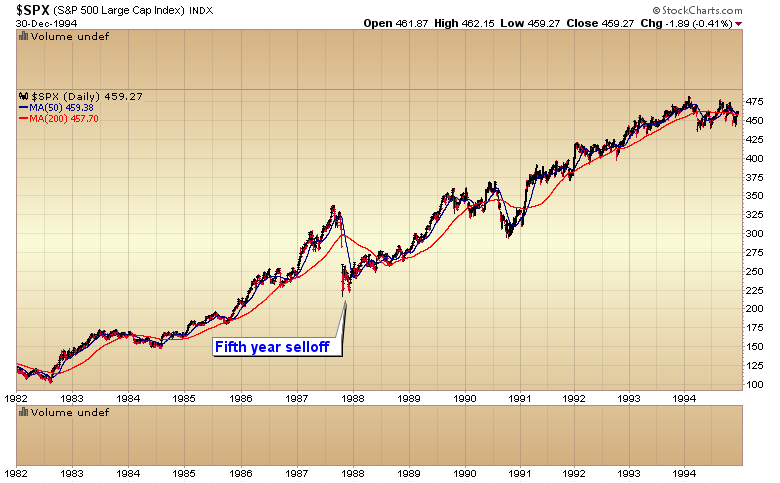 You can see that from `95 till 2001 the dollar was in a secular bull trend. Each one of those cycles topped as extreme right translated cycles and consequently each three year cycle low bottomed well above the previous three year low. That changed after 2001. You can see that the three year cycle that began in the fall of 2001 topped very quickly and then spent the better part of three years declining into the `04 three year cycle low which obviously bottomed considerably below the 2001 low. 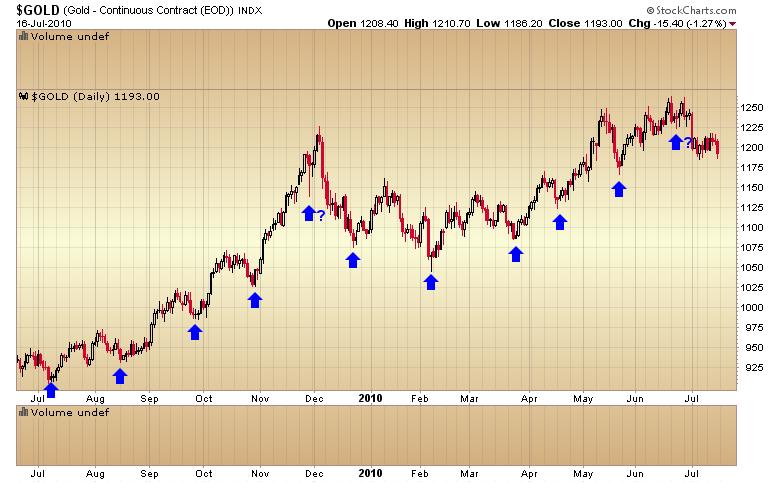 The next three year cycle also unfolded as a left translated cycle and it too moved below the prior major cycle low. Now despite all the bullish talk about the dollar this cycle is also playing out as an extremely left translated cycle which means the odds are high it too will move below the previous cycle low. Unless the dollar recovers quickly and exceeds the high at 90 it will be in jeopardy of breaking to new lows by next year. I’ve said this for some time now that the market is eventually going to make Bernanke pay a terrible price for his insane monetary policy. In the real world, a world where magic doesn’t work, and Santa Claus and the tooth fairy aren’t real, it’s not possible to print literally trillions of dollars out of thin air and not have something bad happen to your currency. I’m sorry folks but the world just doesn’t work that way. If it did we could just print and print till there wasn’t a tree left standing and the value of the dollar would just go up and up. I dare say any teenager can probably grasp the concept of supply and demand. The dollar isn’t immune to the laws of supply and demand any more than any other commodity. The bottom line is that the dollar is approaching the timing band for that move down into the three year cycle low, and unless something changes quick it is in jeopardy of crashing to new lows during that move. And when a currency crashes it is an extremely inflationary event. Next let’s move down to the smaller intermediate cycle. Like gold this cycle tends to last about 20 weeks most of the time. However when Ben cranks the printing presses up it tends to stretch the cycle. You can see that both intermediate cycles during the period of quantitative easing stretched rather long and the second was also extremely left translated. Now however we have a right translated cycle and one that is moving into the timing band for an intermediate bottom. Since it is right translated the odds are it should hold above the prior cycle low which came in around 79.50. Now here is the problem and it has to do with the daily cycle. The daily cycle on average lasts about 20-30 days. The recent low is just slightly in the timing band for that low. If this turns out to be the cycle low (and we will have to wait a bit before we can make that determination) then the dollar needs to put in an intermediate bottom right here right now also. If the dollar rolls over and another left translated daily cycle begins it will almost surely break through not only the 82 pivot but the long term support level at 80. If that happens then the odds are going to be high that the decline into the three year cycle low has its hooks into the dollar and we will indeed see the dollar move to new all time lows by next year. If that scenario unfolds it will unleash severe inflationary pressures. I tend to think the recent divergence by virtually the entire commodity sector is already giving us a warning that the market may be ready to exact it’s toll for the Fed meddling. We’ve already seen a mini-crisis in the Euro. It’s only a matter of time until the cancer spreads to the worlds reserve currency, and our time may be up. Chart of total debt to GDP. This is about a year old so it’s actually a bit higher now. Those who think debt is contracting are sorely mistaken. The government has just taken over where the consumer has left off. This entry was posted in Uncategorized on July 21, 2010 by Gary. 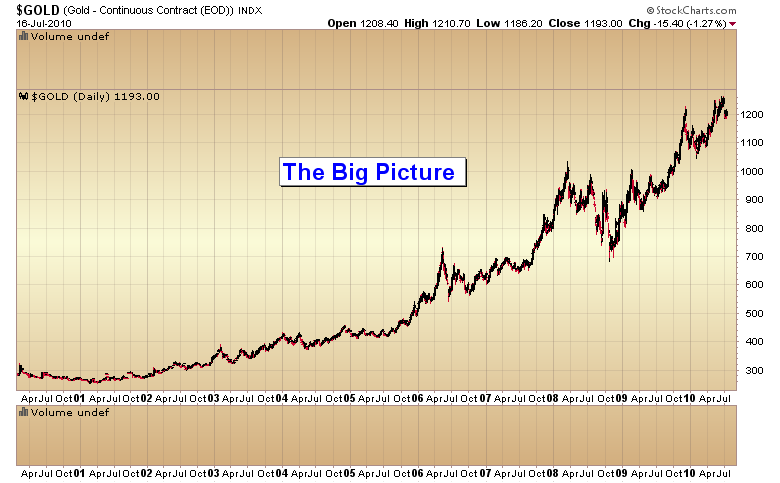 Just like the stock market, gold runs in cycles (all markets do because the humans that trade these markets go through periods of optimism and periods of pessimism). For the purposes of this discussion we will concentrate on the intermediate and daily cycle, after a quick explanation of the two larger degree cycles. 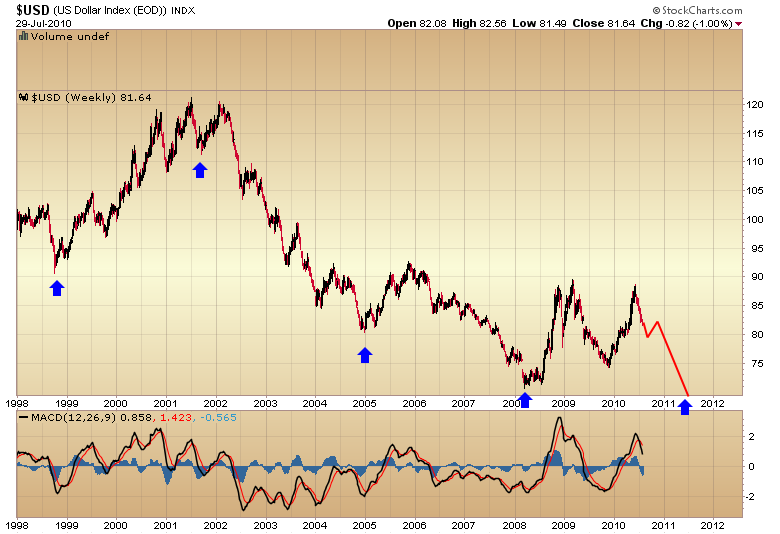 At this point all one needs to know is that gold’s 8 year cycle bottomed in `08 and isn’t due to bottom again until 2016. The yearly cycle bottomed in February, and no yearly cycle except the one at the 8 year cycle low has ever moved below a prior yearly cycle low since the secular bull started in 2001. That means in order for gold to move below $1044 we would have to entertain the fact that the current 8 year cycle has already topped in only two years. That would also mean the secular bull has likely topped. I just don’t buy that, as no secular bull in history has ever topped before reaching the bubble stage and gold is clearly a long way from that. So all this nonsense about gold falling back below $1000 is just that – nonsense. The odds of a move back to $1000 anytime during the remainder of this bull market are probably less than 1%. I don’t know about you, but I make it a rule to never bet on something with odds of success at only 1%. Now let’s move in and take a look at the next larger cycle, the intermediate cycle. This cycle has averaged 18 weeks since the secular bull began in 2001, but has lengthened to 23 weeks after the global debt problems began in `07. My guess is that the Fed’s extreme monetary policy is acting to stretch golds intermediate cycle slightly. 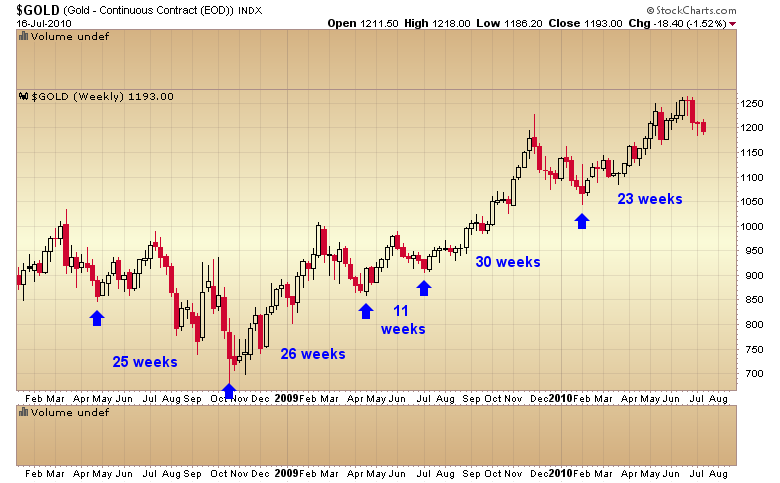 As you can see from the chart, gold is now about to enter the 24th week of the current intermediate cycle. This of course means it’s becoming extremely dangerous to sell gold. On the contrary, this is the time where savvy investors want to be looking to add to positions. Remember, this is a secular bull market after all, and you only get this kind of opportunity about every 5 to 6 months. You certainly don’t want to blow it now as you will have to wait another half year before it comes again, and since this is a bull market the next opportunity is going to come at higher prices. For all you traders who claim that you are going to back up the truck when gold experiences a pullback, well you are getting your pullback right now. The question is, will you follow your own advice? Now let’s look at the smaller daily cycle and see if we can pinpoint a closer time frame for when we should be looking for the final bottom of this intermediate cycle. On average the daily cycle tends to run about 20 days. However, it’s not completely out of the question to see a cycle run as long as 30 days occasionally. I will also note that we usually see a failed daily cycle as gold moves into a final intermediate cycle low. With that in mind here is where I think we are in the current daily cycle which, by the way, does appear to be a failed and left translated cycle as it was unable to break to new highs. It appears we are now on day 16 of this cycle. Since we know that the average duration trough to trough for a daily cycle is 20-30 days, we can extrapolate a reasonable timing band for a final bottom somewhere in the next one to two weeks. Here’s what to look for. 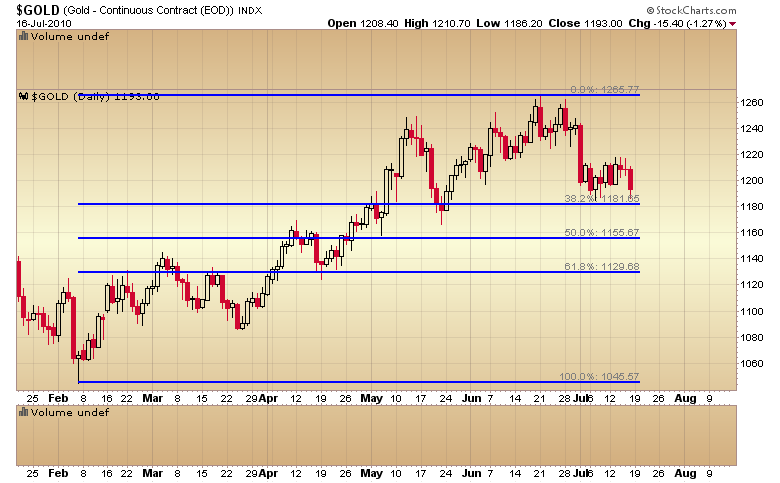 First off, I think gold will need to retrace at least 50% of the intermediate rally. That would come in around $1155. Next, I would like to see sentiment turn extremely bearish. We are already well on our way to that happening as public sentiment is now nearing the same levels we saw at the February intermediate cycle bottom. Another big clue will be to watch the comments on the blog. At intermediate cycle bottoms troll infestation will become intense with comments reaching upwards of 200-300 per post. That is always a fool proof sign that gold is about to slam down on the shorts. Hey, this is a secular bull market after all, what could you possibly be thinking trying to short gold? About this time we will see the conspiracy theorists start blaming a mysterious gold cartel for what in reality is just a normal correction within an ongoing bull market, and one that happens like clockwork about every 20 weeks. So the bottom line is we are on the verge of getting one of the best buying opportunities we ever get in a bull market sometime in the next week or two. The question you have to ask yourself is, will you take it or will you let the “technicals” talk you into missing another fleeting chance to accumulate at bargain prices in the only secular bull market left? Let’s face it, at intermediate cycle bottoms the technicals are not going to look like a bottom. Instead, they are going to look like the bull is broken. Only those people who can think like a value investor and keep the big picture firmly in mind are able to buy into an intermediate cycle bottom. You have to make a decision. Are you going to seize the opportunity or are you going to let the bull trick you into losing your position? This entry was posted in Uncategorized on July 18, 2010 by Gary. Now that gold is holding consistently above $1000 it’s going to become tougher and tougher for gold to shed riders, which is mandatory if the bull is to continue higher. That means the bull is going to have to pull out every trick in the book in order to get investors to jump ship. The greatest trick the gold bull pulls isn’t the D-wave decline (although that is a doozie). No, the greatest trick the bull pulls on investors is the boredom paradox. Basically this rule says that before any big leg up gold will wander around long enough that everyone becomes so bored they finally give up and jump ship. 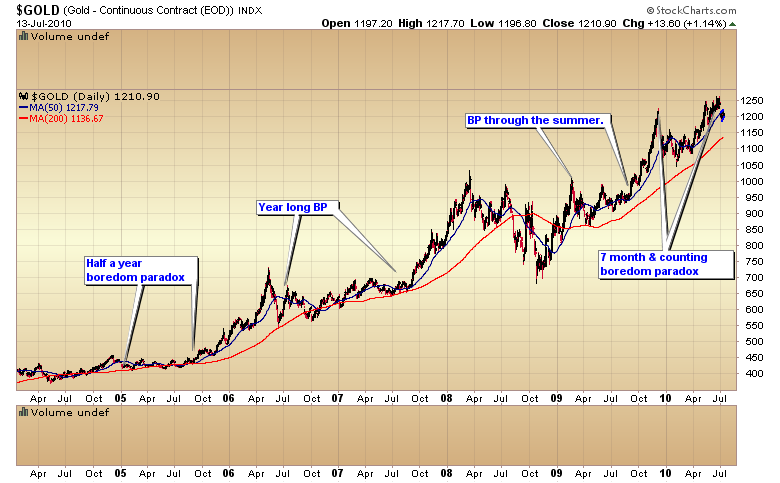 The paradox is that usually during this period gold is trending higher. Let me show you some examples of the boredom paradox in action. You can see these things often occur during the summer months. Ultimately they are consolidation patterns after large legs up. We have been in a tedious BP since last December. 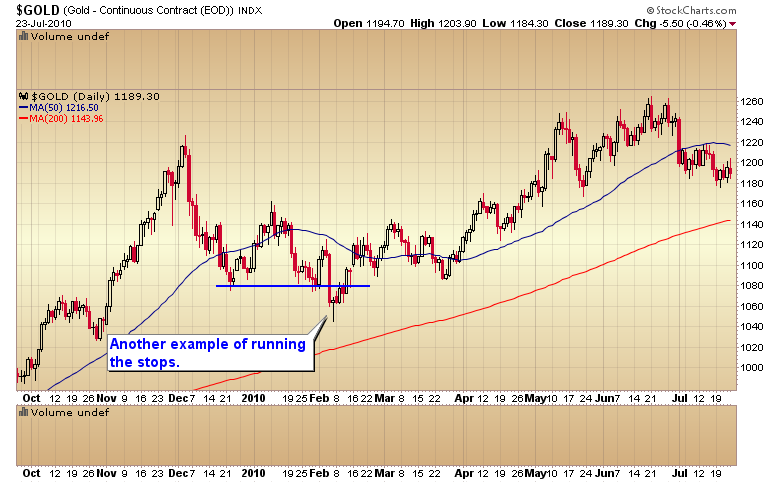 And even though gold has shown enough strength to actually break out to new highs (the paradox) it is still shedding riders at a vicious clip. I know I’ve seen it in progress. During the run up in November last year riders hopped on the bull in droves. My guess is that probably less than 10% of them have had the stamina to hang on, even though gold has made new highs. 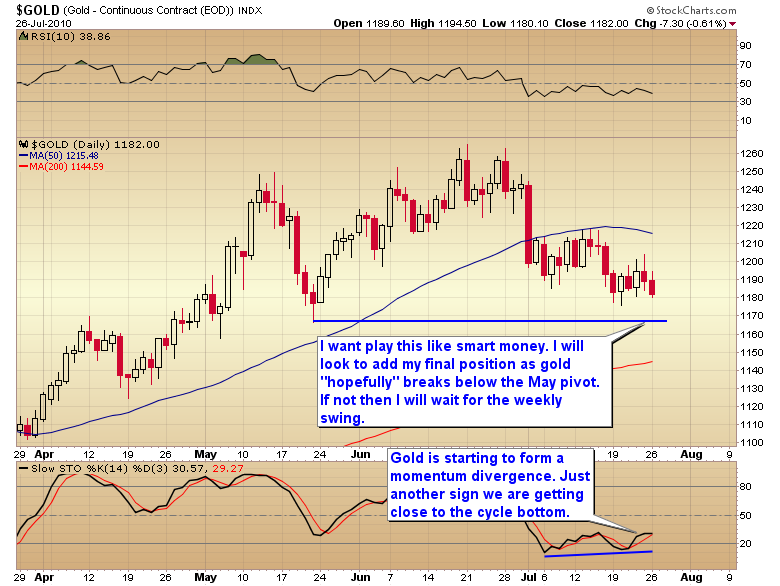 Once gold has shaken off virtually every impatient rider then the next leg up will begin. Trust me none of those lost riders will be able to pull the trigger when it happens and the bull, when he starts charging, will instantly leave them behind. Invariably traders buy when the pain of missing the move just becomes too great to endure any longer and that of course ends up as either a short term top or an intermediate term top like we saw last November. Then of course the correction comes and all those Johnny come latelies end up getting knocked out for a loss. Like I said the bull is going to pull out every trick in the book. Now I know many of you are just chomping at the bit, hardly able to wait for the big parabolic move that will top this monster C-wave. You want it and you want it now. Well I think I can tell you without a doubt you aren’t going to get it any time soon. Even if this is the bottom of the intermediate cycle I can virtually guarantee that gold is going to make you suffer through the rest of the summer. C-waves just don’t top out in the middle of summer. They top either in late fall or early spring. (They also top at the end of intermediate cycles and this one is just beginning.) What we can probably expect is a frustrating grind higher. Each marginal new high followed by another move into a daily cycle bottom. In the mean time some other sector will get hot, maybe it will be tech or energy or whatever. But there will be extreme temptation to jump ship, of that I’m positive. I’ve seen this for 9 years now. Investors get frustrated and lose their position and about that time gold and miners will start to rally. It won’t be noticeable at first. 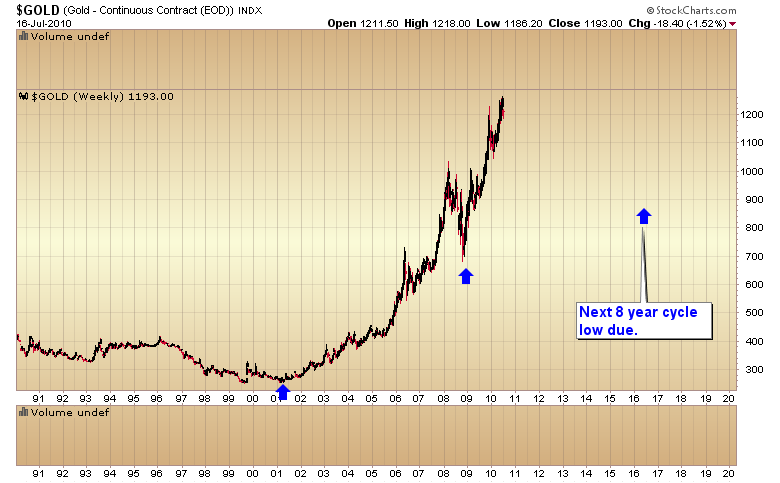 As a matter of fact by the time you notice it gold will be overbought. And you know you won’t be able to make yourself buy into overbought levels, so you will sit on the sidelines waiting for a correction. Some of you will manage to hang on until the correction comes, most won’t. They will panic in at a short term top. It never fails. Like I said, I’ve seen it for 9 years now. Of those that managed to wait for the correction probably less than 50% will be able to buy because as we all know by now, this is a volatile sector. Corrections are scaring looking. It’s tough to buy into them. I have to laugh when I see these comments about how a trader is going to back up the truck if we get a correction. Did any of us see any backing up of the truck at the February low or during the recent correction? No of course not, because bottoms never look like bottoms. They always look like the trend will continue. So the vast majority of truck backers never load the truck. The only way to avoid getting taken out by the Boredom Paradox is to just hang on. As long as you make up your mind that nothing the damn bull does is going to buck you off no matter what tricks he pulls then you will be there when the charge starts. Trust me on this one, all the pain and frustration will be worth it if you can last long enough to make it to that final parabolic move. I don’t doubt for a second that we will eventually see miners break out above that 519 resistance and when they finally do they are going to go a long long ways. I will be totally flabbergasted if we don’t see the HUI above 750, maybe even above 1000 during this final C-wave. But you are never going to get there if you let the BP knock you off the bull. This entry was posted in Uncategorized on July 15, 2010 by Gary. In my last article Bear’s Beware, I warned that shorts were running the risk of getting caught in an explosive rally as the intermediate cycle was due to bottom. Well, it did bottom and bears have watched their profits quickly evaporate as the market has surged out of the intermediate cycle low. The initial thrust out of one of these major cycle bottoms will usually gain 6-10% in the first 8-13 days. We are now 5 days in and up 6.6% so far. 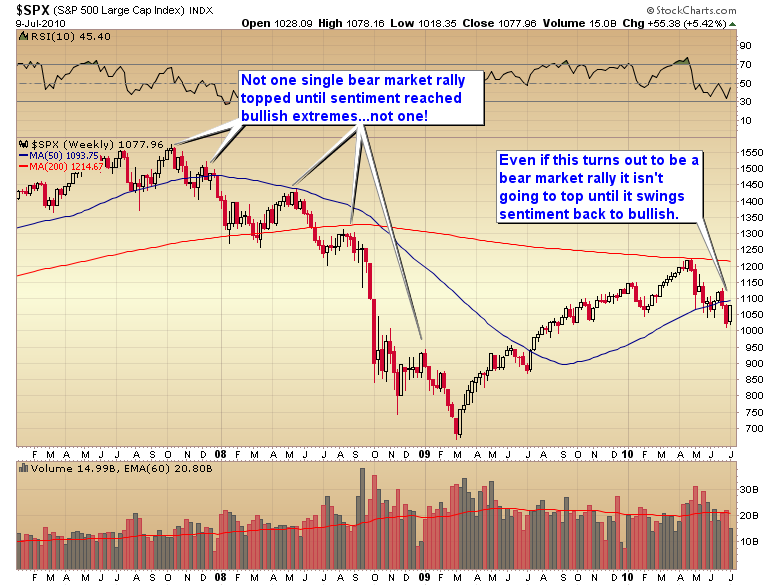 I expect we will see a test of the 200 day moving average before we see any significant pull back. These initial moves out of intermediate bottoms don’t tend to wait around as smart money smelling blood in the street pile in quickly. It’s only the little guy, who doesn’t understand what has just happened, that continues to fight the trend change. This is usually about the time that I see the technicians start calling for this or that resistance level or trend line to put a halt to the rally. They are, of course, assuming this is a bear market rally and it will soon be over. First off, let me say I’m not convinced yet that the cyclical bull is dead. I would need to see the market come back down and break the recent lows first. 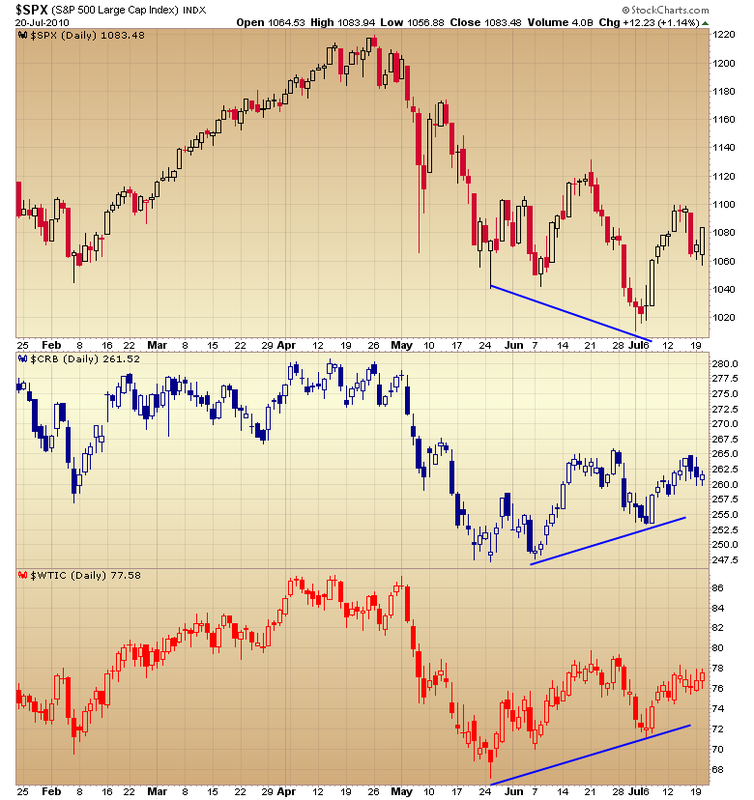 If both the transports and industrials do that then yes, we will have a Dow Theory sell signal and at that point I would have to assume that the market has begun the third leg down in the secular bear market that started in March of 2000. Now let me say this, bear markets don’t begin because of lines on a chart. They begin because something fundamental is broken in the economy or financial system. Now we certainly do have a broken financial system, no doubt about it, but then again this cyclical bull was never built on the foundation that we had fixed anything in the financial sector. We certainly haven’t fixed anything in the economy with unemployment remaining above 15% if one counts everyone out of work. No this cyclical bull was built on a foundation of massive liquidity. I’m not convinced yet that that fundamental base is broken. Only time will tell. But even if this is a bear market rally let me assure you that bear market rallies don’t end because of lines on a chart. If you think you are going to spot a top in a bear market rally by drawing a few trend lines or some meaningless resistance level you are just kidding yourself. It ain’t gonna happen. It never has and it never will. Lines on a chart don’t halt bear market rallies anymore than they initiate bear markets. I’ll tell you exactly what halts a bear market rally. Sentiment! Sentiment, at every single one of those rallies during the `07-`09 market, reached bullish extremes. Not one single rally was halted by a pivot point or resistance level prior to sentiment reaching extreme bullish levels. Even after the recent surge, sentiment is still so depressed that it’s at levels lower than most of the intermediate bottoms during the last bear market. So let me tell you, if you think the market is going to turn tail and run because it hits the pivot at 1130 or the 200 day moving average, or because you think earnings aren’t going to be rosy, you are going to be sorely disappointed. If this truly is a bear market then before you even begin to look for a technical turning point you first have to wait until sentiment does a 180 degree turnaround. That just doesn’t happen quickly after the kind of beating we just got. Trust me, it’s going to take a while for investors to forget a 17% correction and dare to become bullish again. If I had to guess I would say at least 8 to 11 weeks. Even longer if the next half cycle (due around day 15-20 of the rally) and full daily cycle correction (due around day 35-45 of the rally) are strong enough to scare investors again. The problem with the move out of February bottom was that we got no corrections and it quickly turned into a runaway move. Those kind of rallies tend to end with some kind of mini-crash. I started telling subscribers there was a high possibility of that back in late March and early April. 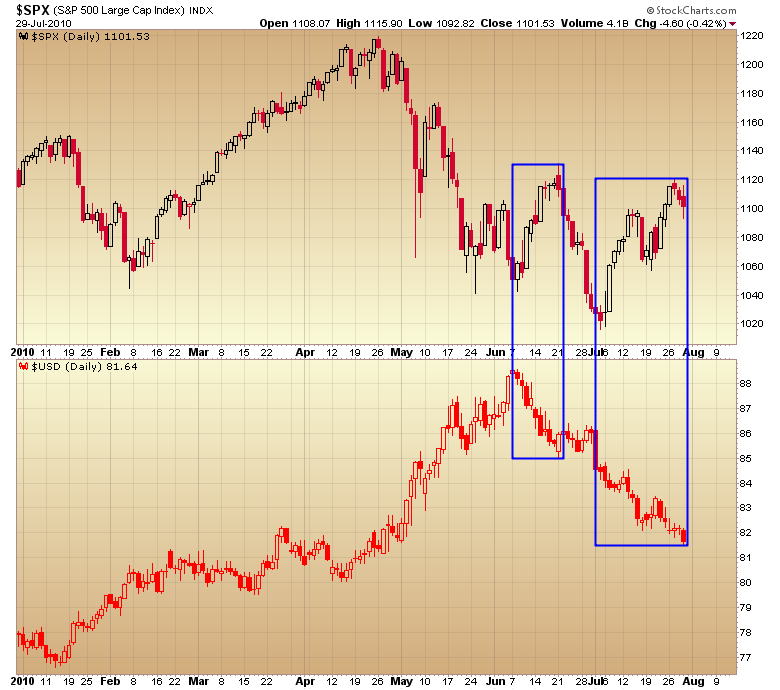 It happened in Feb. of ’07 with the China crash and sure enough, it happened again in May with the flash crash. Traders become extremely complacent during one of these runaway moves. 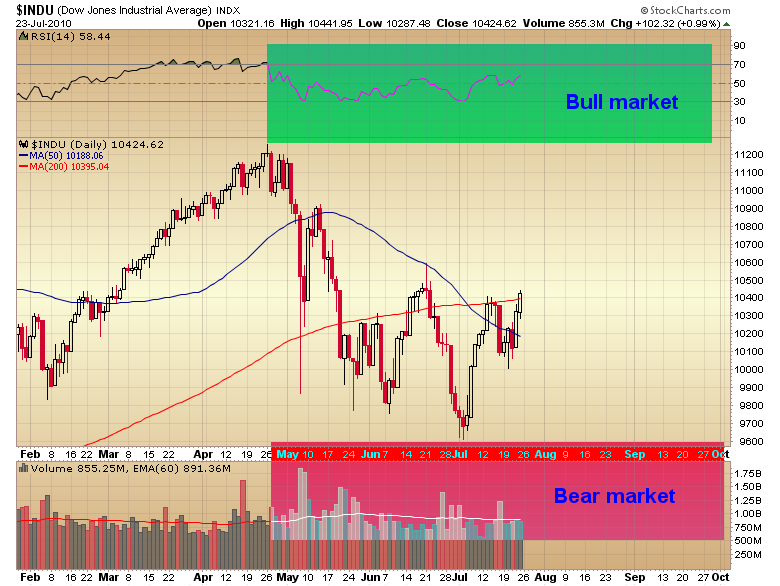 At the April top sentiment had reached levels more bullish than at the top of the last bull market. As usual, we paid a heavy price for that complacency. But now we’ve swung 180 degrees back in the other dierection, with sentiment so depressed it even makes the `09 bottom look positively giddy. That my friends is the base for another powerful rally. Actually I won’t be at all surprised if the market rallies back to new highs … even if we have begun the initial topping process of this cyclical bull. Remember the bear market had already begun in the summer of `07 but that didn’t stop it from rallying back up to marginal new highs in Oct. before finally rolling over into the second worst bear market in history. This idea that the markets can somehow magically look into the future is just ludicrous. I can assure you no one can see the future, and that includes the millions and millions of investors that make up the global markets. Now let me say this – we already know where the cancer is. Does that mean the stock market will now start to discount the next bear market? In the summer of `07 we knew the cancer was in the credit markets, initially beginning in the subprime mortgage market. Did the market look into the future and discount the unraveling of the global credit markets at that time? No it did not. The stock market rallied to new highs. Well, we already know what will eventually bring this house of cards down, it’s already started just like it had already started in the summer of `07. We are going to have one sovereign debt implosion after another and that is going to lead to the cancer spreading through the global currency markets eventually infecting the world’s reserve currency. But don’t expect the market to look ahead and begin discounting the unraveling of the global currency markets. Markets don’t do that. What they do is slowly recognize the fact that the fundamentals are broken. Once enough traders realize that, the markets begin to roll over, usually in an extended process taking many months. I doubt this time will be any different, especially since the central banks of the world are going to fight the bear with a blizzard of paper. Don’t make the mistake of thinking the markets have to act rationally. They don’t and won’t. If the Fed prints enough money markets are going to rise even though the global economy is crumbling all around us. If you are bearish and determined to pit your stash against Ben’s printing press I’m afraid you are signing up for one very difficult time ahead. I seriously doubt we are going to see another credit market implosion like we saw in `08. Without a severe dislocation like that there will be no market crash this time. When the bear does return (and he will eventually) the next leg down is going to be a long drawn out process with multiple violent bear market rallies. Selling short in that kind of market isn’t going to be easy. As a matter of fact I doubt 1 bear in 10 will even manage to make money in that kind of environment. Bear’s should be careful what they wish for. I suspect the next leg of the secular bear will manage to destroy both bulls and bears alike. This entry was posted in Uncategorized on July 11, 2010 by Gary. First off a little history to dispel some myths. I’ve know that the head & shoulders pattern that everyone is afraid of doesn’t actually hold up to testing being little better than a coin toss. Well Jason Goephert of Sentimentrader.com actually ran the data and it’s much worse than a coin toss. The percentage of times the pattern reached it’s target was 27% for an average return of -1.2%. Not exactly a great risk/reward setup. Like most of these technical patterns that people take as gospel The H&S pattern when examined under the microscope of history rarely lives up to it’s reputation. Now you see why I don’t put a lot of emphasis in lines on a chart. Most of the time they are just… lines on a chart! Here is what is happening. 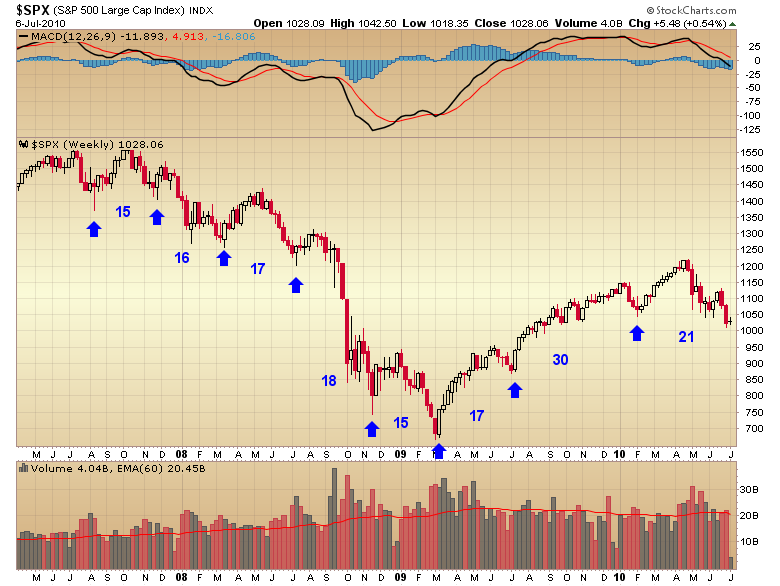 Roughly every 20-22 weeks the market dips into a major intermediate cycle low. The cycle tends to shorten a bit in bear markets simply because humans can’t remain negative as long as we can stay positive. In either case our emotions become exhausted and need to take a break. We are now 21 weeks into the cycle that began at the Feb. low (22 if this week ends up moving below last weeks intraweek low). The same thing is happening in the gold market. Just like February I expect both cycles will bottom in tandem. 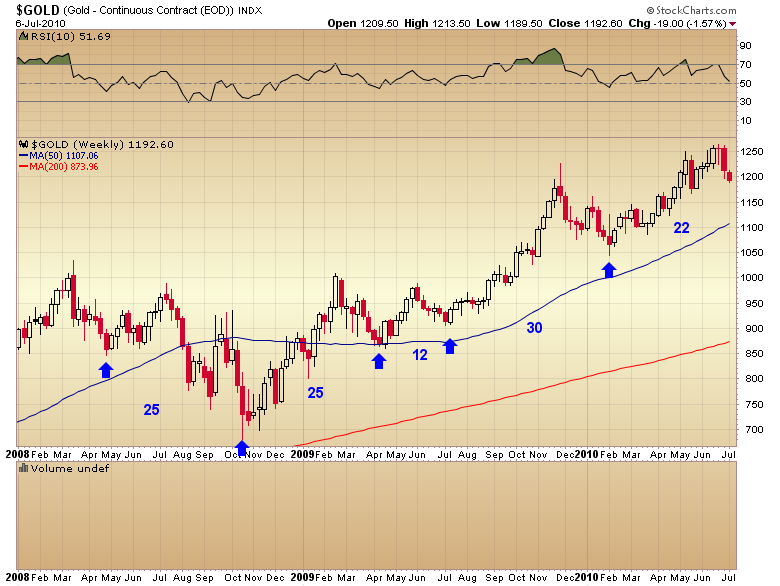 At that point gold should take off into the final leg up of the ongoing C-wave. The stock market is another question altogether. We are in a secular bear market after all and the stock market could bounce out of the coming cycle low and fail to make new highs before rolling over again. If that happens then yes I will call the bear market. But I’m just not prepared to call it as we move into the final ultra negative period of an intermediate cycle low. We simply have to see what kind of bounce develops out of the coming bottom first. This entry was posted in Uncategorized on July 7, 2010 by Gary.